Red kites and buzzards were as rare as rocs and phoenixes when I was growing up. To encounter one in southern England in the 1970s was magical. Today, thanks largely to changes in gamekeeping practices and pesticide use, these handsome raptors are everywhere and consequently I no longer automatically stop and stare when I see one. Ubiquity has diluted their mystique. 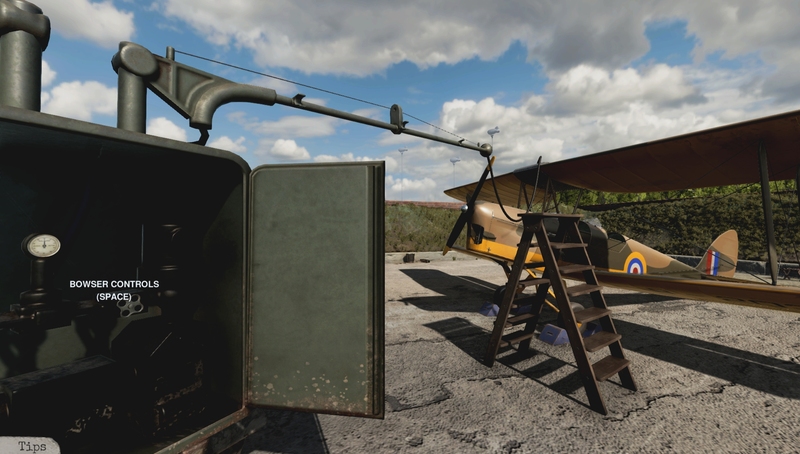 I’ve experienced something similar with virtual Spitfires. Deprived then spoilt rotten, the sight of a polygonal warbird with elliptical wings no longer makes my heart beat faster. Resigned to this state of affairs, I really wasn’t expecting an unheralded spanner-em-up from Poland to restore my sense of awe. 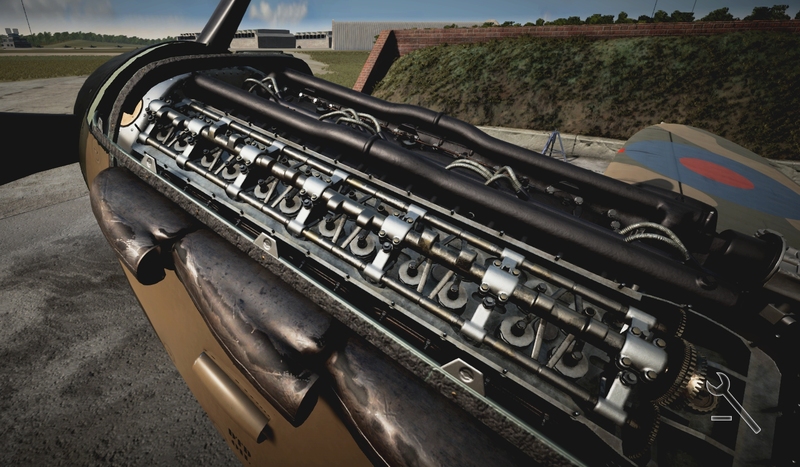 Plane Mechanic Simulator (Original ETA: yesterday. 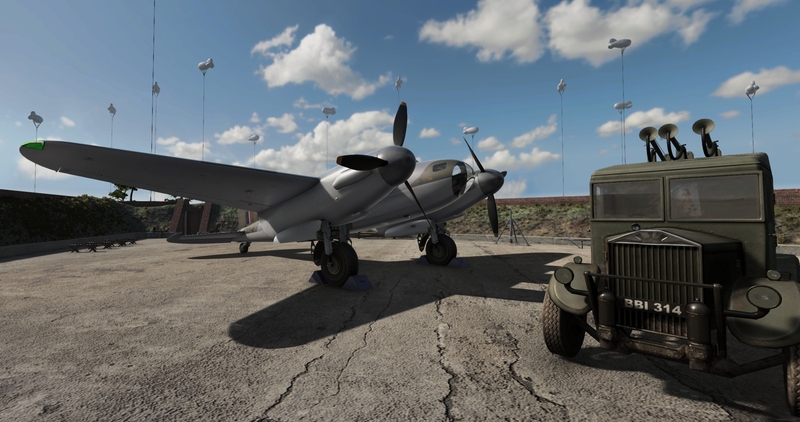 New ETA: next Wednesday) takes the cars and contemporariness out of Car Mechanic Simulator and replaces them with flying machines and the early 1940s. 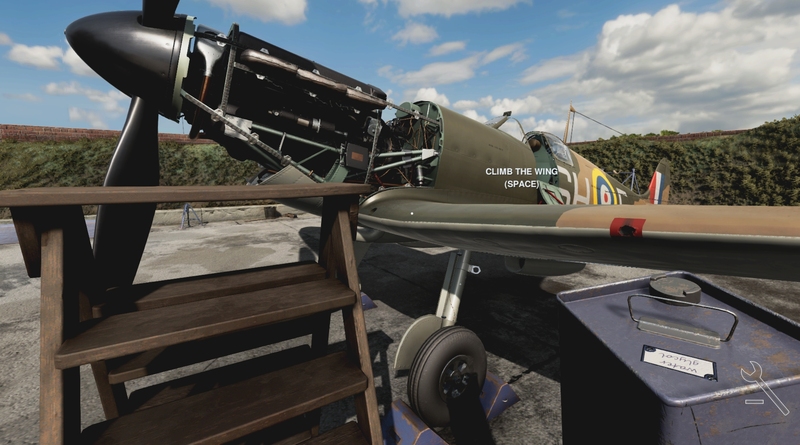 You play an RAF ‘erk‘ shinning up a greasy career pole by completing a lengthy series of engrossing maintenance and repair jobs on British WW2 aircraft. Plausibly and sensibly, before being letting loose on Fighter Command’s finest, you must prove yourself on its lowliest. The first twenty or so of the 81 missions involve a de Havilland Tiger Moth, the biplane trainer on which the majority of RAF pilots of the period learnt the basics of airmanship. Roughly handled by ham-fisted novices, your charge’s undercarriage, prop and four-cylinder Gipsy Major engine often require attention. Its airframe, rigging, instruments, cockpit controls, and flight control surfaces are either staggeringly robust or someone else’s responsibility as you’re never asked to attend to these. Most work is accomplished with the aid of the WASD keys, a moveable stepladder, and a tri-mode cursor. Assuming you’re not playing at ‘expert’ difficulty (a setting I’m saving for playthrough #2) clicking on a component in disassembly mode highlights the nuts and bolts that must be removed to free it. To unfasten a line of bolts you simply touch them in turn with a dragged cursor – a sage piece of shorthand that prevents encounters with elaborately secured parts like crankcase covers from turning into exasperating mouse marathons. Click on a component in diagnostic mode and, after a short ruminative pause, the component’s condition is indicated with text and colour-coding. More often than not faulty and worn parts must be replaced (a well-stocked parts truck stands closeby at all times). Occasionally, something is eligible for refurbishment meaning you scamper off to a work bench in the corner of the blast pen, examine the malfunctioning gizmo, searching for its four ‘lube points’, which you then attempt to lubricate using neither too much or too little oil. The maintenance minigame is PMS at its most stylized. Fortunately the majority of other activities are simmed far more sensitively and literally. Take refuelling for instance. 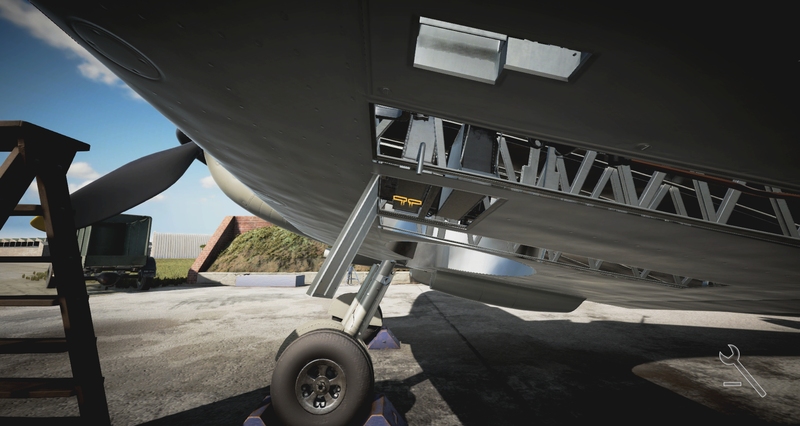 A mundane task you’re expected to perform in perhaps one out of every two missions, this multi-step chore would quickly become tiresome if it wasn’t for redolent equipment physics and some nice sound effects. Because unhooking the fuel hose from the Albion refueller, dragging it across to your carefully placed stepladder, then ascending, inserting the nozzle into the Moth’s upper-wing fuel tank, and darting back to the truck to begin pumping, is so pleasingly tactile/musical, I’ve yet to weary of it. Disaster Studio have modelled other regular duties with similar care. 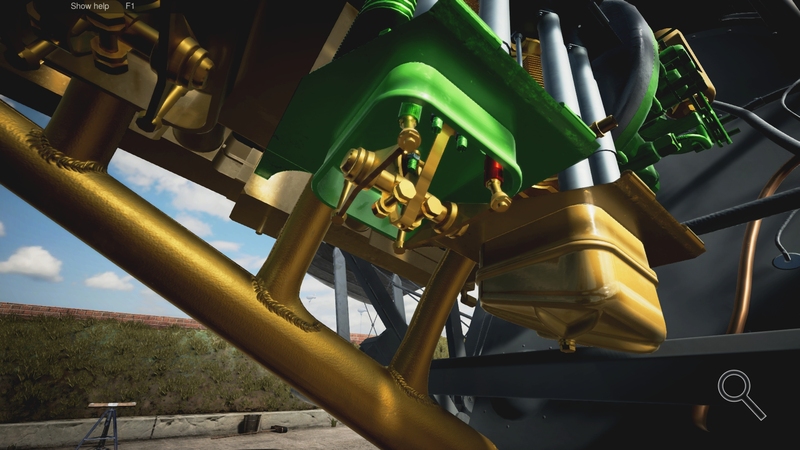 The small manually-propelled oil bowser rolls and pivots with just the right amount of inertia. I love the way that the cranks on the jacks employed when servicing the undercart turn effortlessly as you ‘take up the slack’ then abruptly stiffen when lifting the weight of the aircraft. Myriad little touches like these make the game’s daily grind unexpectedly satisfying. That said, without the career’s dash of detective work and steady dribble of new activities, Zen-like absorption would probably morph into boredom in time. The game has an endearing way of suggesting without spelling-out. Work sheets talk of taxiing problems, misfiring engines and heavy landings rather than baldly stating which parts need to be located and renewed. You find yourself delving deeper and learning more with each passing challenge. Over time you speed up, taking fewer unnecessary steps and making fewer gaffes. Having ‘fully’ overhauled and reassembled an engine once without noticing an easy-to-miss blown head gasket, it’s unlikely you’ll ever do it again. Just as the topsy-turvy Gipsy Major is becoming an open book – an old friend – it’s replaced by something far more intricate and impressive. 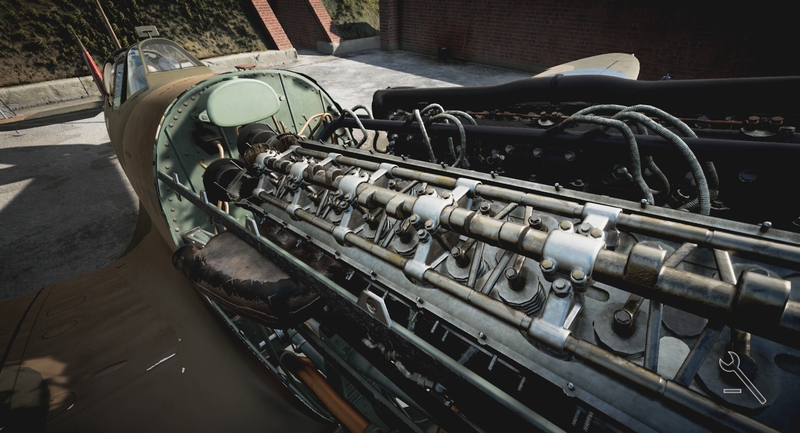 Gazing upon the exposed innards of a virtual Rolls-Royce Merlin for the first time, having relied on one for success and survival so often during my gaming career, was, I’m not ashamed to admit, a faintly spiritual experience. The rest of the beautifully sculpted and textured PMS Spit is pretty special too. 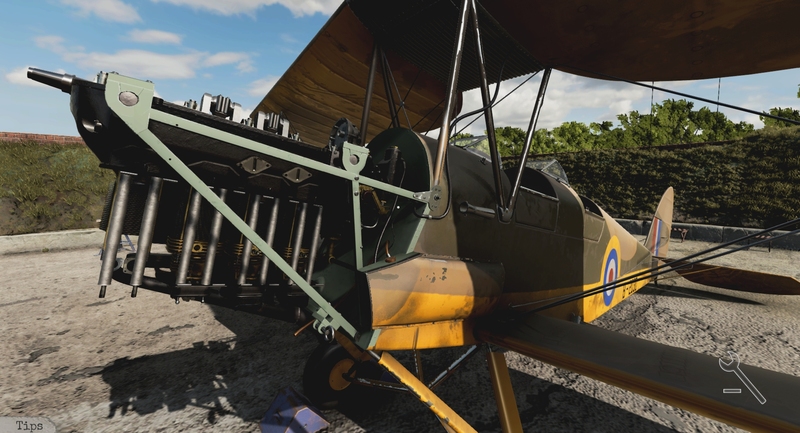 Like the Tiger Moth its fixable components are clustered in the nose and landing gear area, but all those extra cylinders, valves and spark plugs, together with new armament, coolant, and riveting* duties, ensure the second third of the game feels quite distinct from the first. * Perforated Spits can be patched up with small circular Alclad discs and a stuttering pneumatic rivet gun. I’ve learnt things about Spitfires during the past few days that decades of sim use, book perusal, documentary watching and museum visits hadn’t taught me. 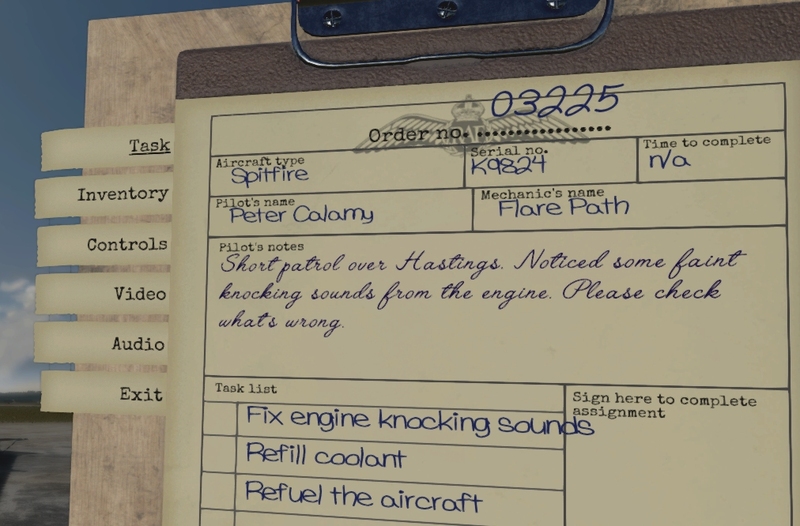 I’d now know roughly what to do if someone asked me top up the glycol, extract the gun camera film, or replace the bottles for the pneumatic system on Britain’s most famous fighter. In a pinch I reckon I could even rearm an ammo-less Spit without too much difficulty. 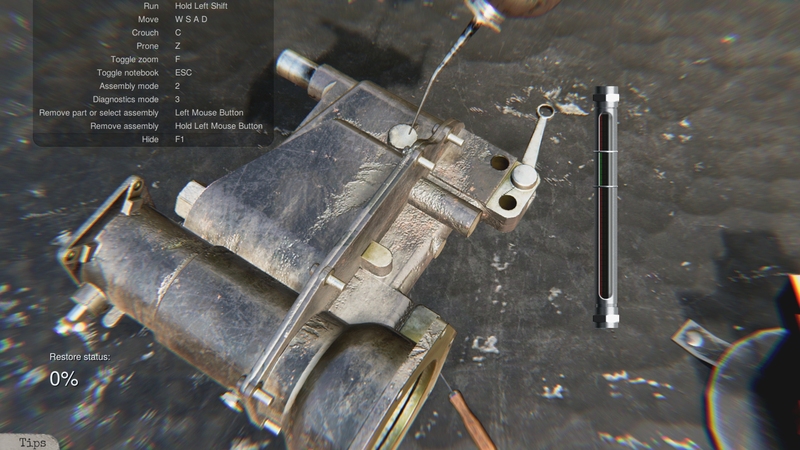 While the game’s procedures aren’t completely accurate and many modelled components are simplified (things like carburettors, pumps and magnetos are treated as single, indivisible items) there’s information about fastening locations and workflow that would almost certainly prove useful if, courtesy of a poorly fenced/signposted rent in the space-time continuum, you ever found yourself erking for the RAF during the Battle of Britain. 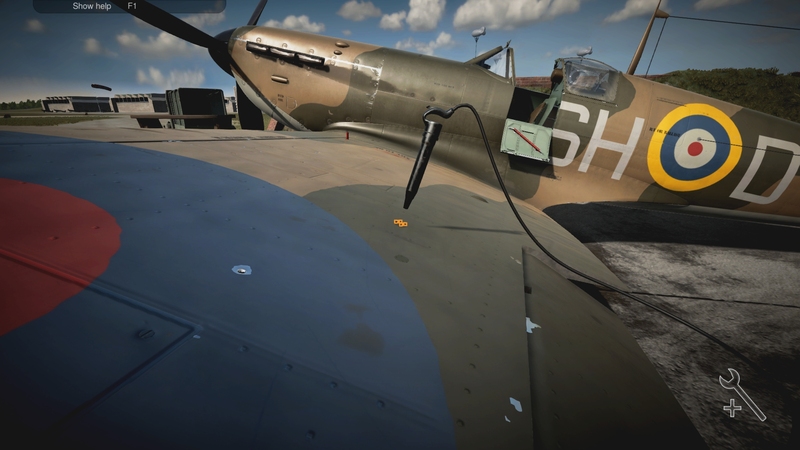 One of the most interesting and unfamiliar Spitfire-related activities I’ve mastered thus far, is gun harmonisation. Join me as I do the deed on K9824’s Messerschmitt mutilators. 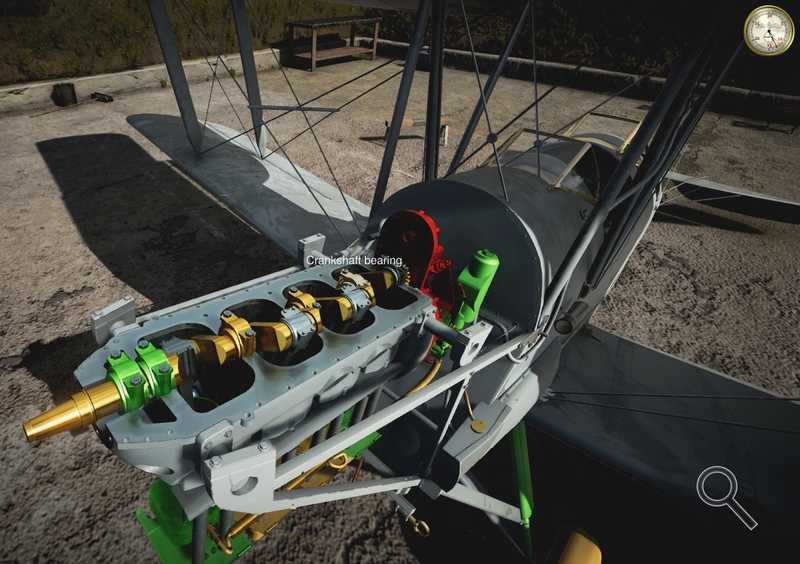 After setting up the harmonisation target out on the airfield (move to appropriate crate and press SPACE) and placing a large trestle under the tail to level the aircraft, I hop onto the wing and begin removing the panels that conceal the quartet of artfully embedded Brownings. Once the machine guns are exposed I flip open their breech covers, withdraw ammo belts, and insert the special harmonisation periscope in the first weapon. Peering down the gun barrel I should see the targets with Surrey beyond but in fact see nothing but an unhelpful red circle. What a chump, I’ve forgotten to remove the fabric gun port patches from the wing’s leading edge! A minute later, with the doped covers ripped off, harmonisation begins in earnest. Using the mouse and WASD keys I carefully point the Brownings one at a time at the respective bullseyes on the distant target. Like most in-game processes, it’s not exactly rocket science but there’s a pleasing sense of accomplishment when, after all weapons have been aligned and hidden away again, the game quietly announces that that part of the mission is done and dusted. Next time K9824 takes to the skies her lead streams should meet where they’re supposed to meet. Occasionally, a sense of urgency is injected into proceedings by nicely contextualized time limits. The first time I encountered a stopwatched task, I failed it in fine style and feared my career was about to come to a grinding halt (As PMS’s sole mode is basically a linear sequence of scripted challenges, difficulty spikes would pose a big problem). Happily, apart from a few docked ‘merit points’ and a sarcastic footnote on the debriefing sheet there were no real consequences. Every so often your merit point tally reaches a promotion threshold and you’re asked to spend three skill points on new talents and (invisible) underlings. The more assistants you have, the more bolts you can unscrew simultaneously. ‘Good connections’ stretch time limits. Mechanical specialisms mean faster fault diagnosis. 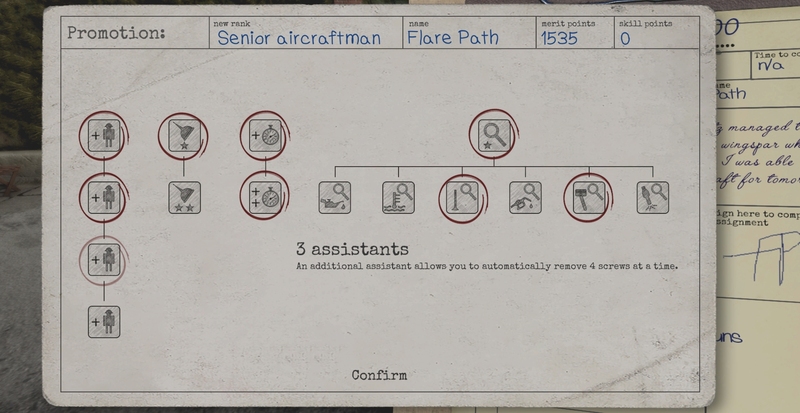 Fifteen hours in I’m currently a ‘Senior Aircraftman’, a fact that means almost nothing in practical terms except that I’m not all that far away (roughly 5 hours, I estimate) from gaining access to the game’s third and final aircraft type, the de Havilland Mosquito. On hearing, a few months back, that a Mossie was to be included in PSM I was rather excited. Now, with some play experience under my belt, it strikes me that Disaster could have chosen better. 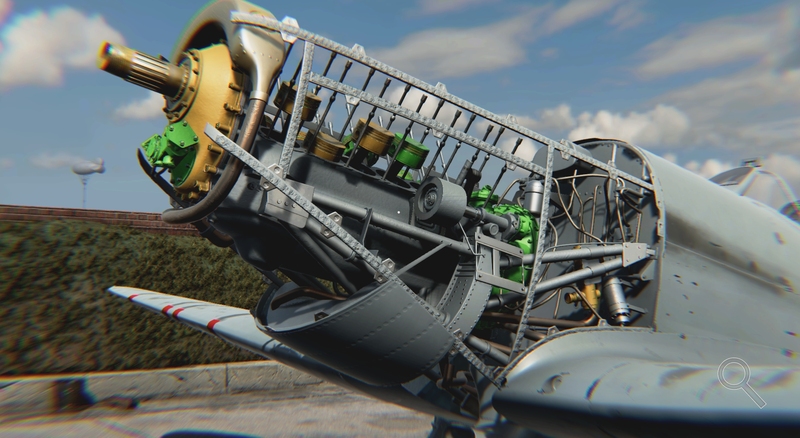 After two aircraft powered by iconic inline engines, it would have been lovely if the sim had culminated with a Blenheim or Beaufighter, a machine powered by iconic radial engines. 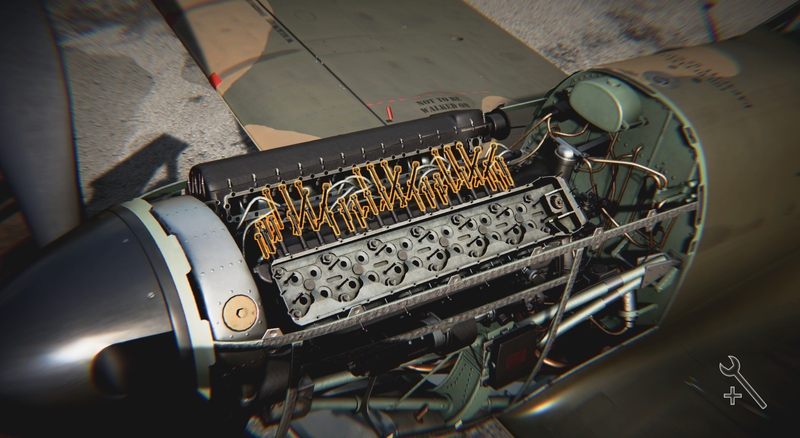 I hope I’m wrong, but working on the Mossie’s powerplants (two Merlins) promises to be little different from working on two side-by-side Spitfires simultaneously. Although a free Beau or Blenheim is probably too much to ask, I’m hoping that the Polish devs engineer modest changes elsewhere during the Early Access period. A top priority has to be replacing the toe-curling “No!” exclamations that play whenever you try to loosen a part before its time. Presently voiced by an American actor who seems to be under the misapprehension that he’s contributing to a dog training game, the undemanding part cries out for a Bernard Cribbins or James Hayter type. The airfield backdrops could do with a spot of enlivening variety too. I’ve yet to work under a grey sky, see a friendly aircraft take off or land (they occasionally fly over), or a fellow erk stroll or cycle past on the way to another blast pen. Apart from the patchable bullet holes and the engagements briefly referenced on the job sheets, there’s no real sign of the Luftwaffe either. The odd airfield crater, smoke column, and all-clear siren, would do wonders for ambience. REMF, a PMS-like game concept put before the Flare Path dragons in 2017, includes several colour-injecting ideas (shelter dashes, news reports, romance…) that Disaster might profitably pilfer. Which isn’t to say PMS lacks atmosphere at the moment. There have been times this past few days when elbow-deep in the guts of a Gipsy Major or Merlin, or straining to move an oil bowser into a position or hump a can of glycol up a stepladder, the walls of Flare Path HQ have dissolved like breeze-teased Woodbine smoke. 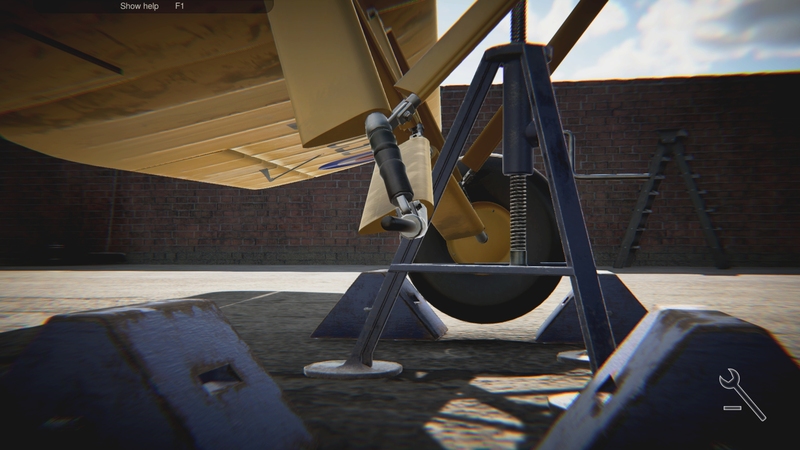 Disaster Studio have created something remarkably fresh and evocative in Plane Mechanic Simulator. 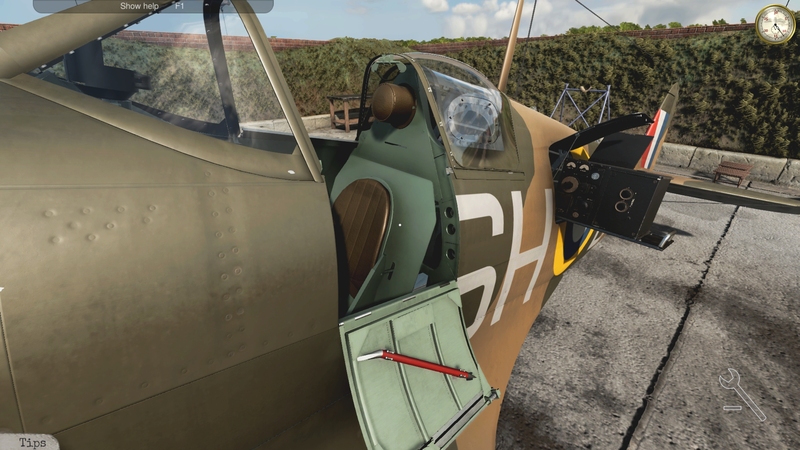 A perfect complement to sims like Battle of Britain 2 and Wings Over the Reich, this is a game that will change the way you think about both the legendary Spitfire and the men that worked long hours, often in difficult conditions, to keep them fighting fit.